Being British I obviously need to talk about the weather some more and do a little bit of reminiscing about the heatwave weekend! How amazing was that? So amazing that I spent the rest of the month forgetting that it wasn't actually Summer and wondering why on earth it had turned so cool. We spent our heatwave mooching up the Northumberland coast without a plan. We stopped the car every time we spotted a beer garden with available seats which lead us to this lush little place - The Coach Inn at Lesbury has the most picture perfect outdoor seating area for a sunny day. If you have any great beer garden recommendations in the North East make sure you let me know! We had some giggles on my Instagram this month when I posted this picture and happened to mention that it makes me feel a little like a chimney sweep. We then all got into a discussion about when you accidentally go out in fancy dress - my most frequent unintentional costumes are sailor, doctor and artist! What are yours? Who knew that you could get styling advice from your home at John Lewis? I was invited to the store in Intu Eldon Square to discover more about their Home Design service and was amazed to discover that they offer free style advice which includes a 90 minute in store appointment to discuss devising a new look for a room in your home or a Design Consultation (£250 - redeemable when you spend over £1,500) which includes a home visit and personalised design scheme. Simon and I are currently arguing over how to give our living room a refresh so I'm looking forward to a spot of mediation from the lovely team at John Lewis Newcastle! We were so happy when our friends Gary and Jenny came to visit us for the weekend. We love when people come up to the North East although it's funny how difficult it is to plan what to do when guests arrive (just me?) In the end we decided to go for a nice stroll from Whitley Bay to Tynemouth. We finished our weekend by starting "Stranger Things" on Netflix, I'd been meaning to watch it for ages and now I'm completely hooked. It's so good and I can't believe I left it so long! You know that I can't resist a seasonal burger at Fat Hippo and, although I say it every time, I think their Easter offering beats them all. When most people were dieting after overindulging on Easter eggs I popped into Underground and ordered a "Eggs Gon' Give It To Ya" - Double 4oz patty, American Cheese, Short Rib Gravy, Fried Egg and Maple Butter Sauce served with Cajun ziggy fries. I've reached the conclusion that every Fippo burger should contain egg and gravy - it's a killer combination! It was an exciting month for Durham Distillery who invited me to a VIP night at the newly opened Hotel Indigo in Durham to celebrate the launch of Durham Whisky as well as announcing their new city centre location. Their new brewery at the Riverwalk development will hopefully be open by the Autumn and will welcome members of the public in for tours (can't wait!). If whisky is your thing you can discover more about the new project here and how you can get your hands on the first bottles of whisky produced! After a good year or so of dunking my engagement ring into mayonnaise it was in desperate need of a clean. I can't believe how dull it had got considering I've only had it for a few years! I'd been wondering where to go to get it cleaned for a while and was then introduced to S Murray Jewellers in Grainger Market, they're next door to my favourite place (Pet Lamb Patisserie) and offer a great range of services including jewellery repairs, battery replacements and ring cleaning. I left my engagement and wedding rings with them whilst I went shopping and a few hours later they were looking as good as new. I can't get over how sparkly they now look! Now that Spring is here I'm getting as much wear out of my blazers as possible and I love being able to leave my big bulky coat at home on days when the sun shines. I got this M&S beauty for my birthday and it's the perfect wardrobe addition for Spring, I love the yellow thread that runs through the design - it makes me think of sunshine and daffodils. The hottest day of the year saw us frantically climbing into the car after work to seek out some sunshine which actually proved to be a little harder than expected. Deciding that Tynemouth was the best destination we got there to discover it was heaving with drinkers (who were all a little worse for wear!) and every bar and cafe was rammed. In the end we managed to find ourselves a little spot in Lola Jeans and finally got to try out their burgers that everyone raves about. Winner of the Battle of the Burgers several years in a row, we now understand the hype. Wow! I went for the John Dillinger (Two beef patties in a garlic butter brioche with mozzarella, Napoli sauce and crispy pepperoni. I can't wait to go back and try more! I was treated to a complimentary ring clean and polish at S Murray Jewellers in exchange for letting you all know my honest opinion of their service. 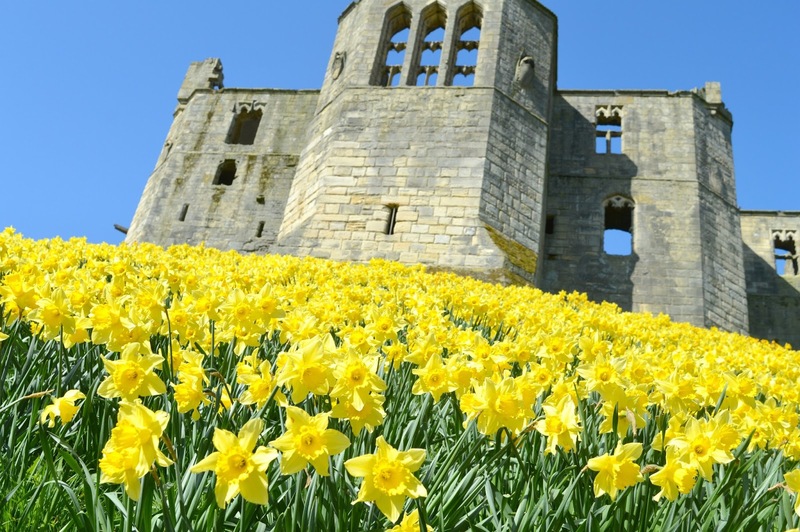 After a successful first visit to Hexham we've become determined to tick a few more places off our Northumberland bucket list this year and, being a daffodil obsessive, it only seemed right to finally see the gorgeous daffodils at the castle and plan a day trip to Warkworth. 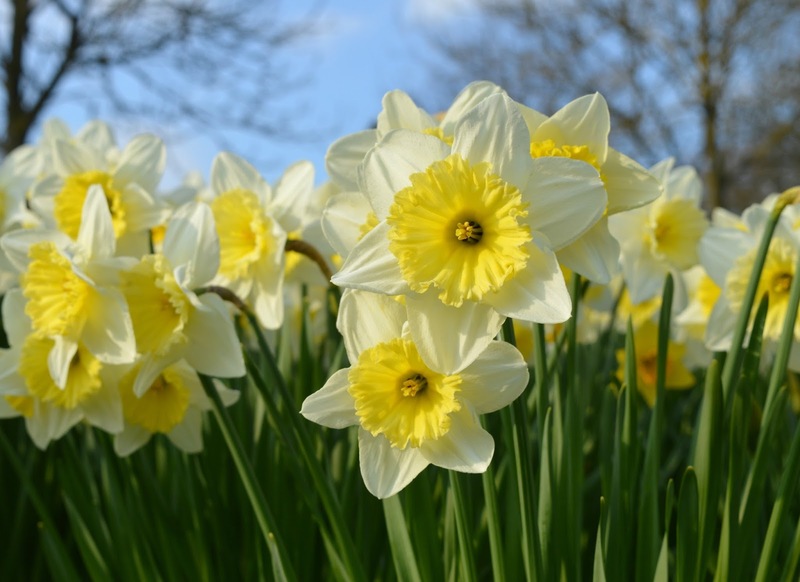 I've lost count of the amount of people who have said to me "you love daffodils? you must go to Warkworth Castle!" Can you believe this was our first visit? My enthusiasm paid off and we were one of the first into the carpark at Warkworth Castle. It costs £3.20 to park all day, is a great central spot to leave your car and, if you do decide to go for a potter round the English Heritage site, you get a refund on your parking ticket. No castle jaunts for us this time, we headed straight round the side of the castle for our first glimpse of the daffodils. Wow! How had we not been here before? Our first glimpse of the golden yellow hill had me squealing with delight and I practically skipped through the grass (despite wearing very inappropriate shoes and the ground being a tad soggy) to go and join the other photographers trying to get that perfect shot of the daffodils with the castle. Cursing my bad wardrobe choices (seriously, who wears a short skirt to crawl about on wet grass taking photos of flowers?!) 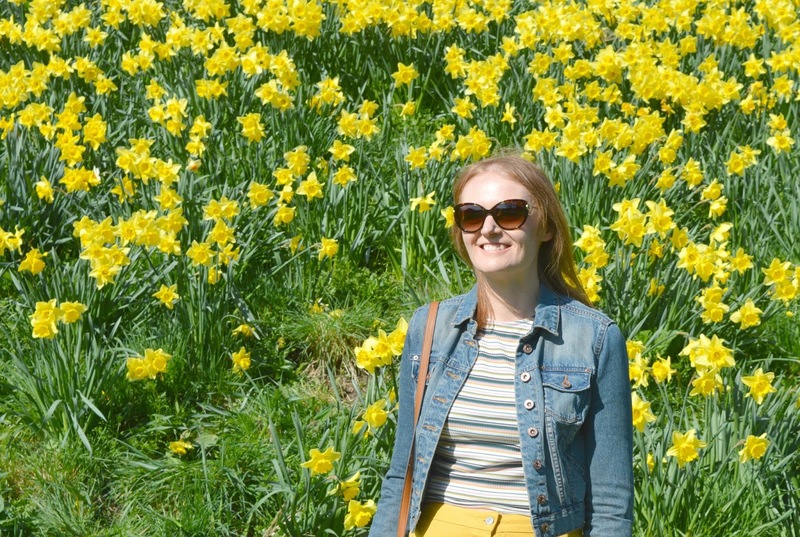 I set about photographing, appreciating and generally flouncing around in the daffodils, turning around every now and again just to double check that my husband hadn't walked off in the opposite direction in embarrassment. 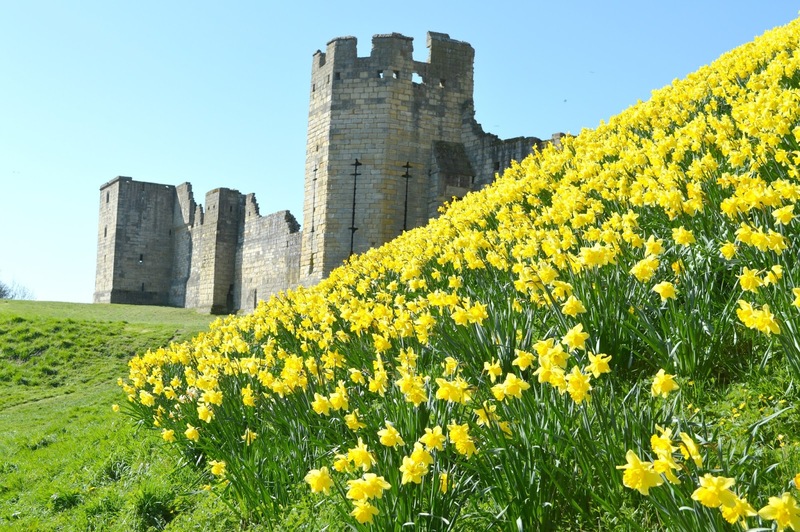 The entire hill was covered as far as the eye could see in perfect little yellow trumpets and the stunning castle sitting at the top against the blue sky had me thanking my lucky stars yet again that I call the North East my home. Once I'd tired myself out enjoying the daffodils we realised that we were feeling pretty peckish and it could be a good time to stop for some refreshments. Since arriving in Warkworth my social media had been going crazy with people telling us that we had to go to Bertrams for food and when that many people tell you how great somewhere is it's a good idea to pay attention! 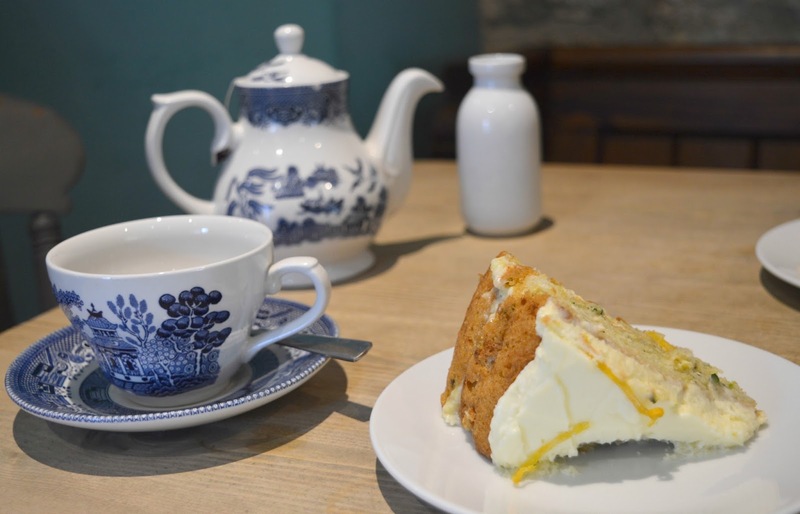 When we arrived a lot of customers were tucking into very delicious looking breakfasts but we were there for cake and once I'd finally chosen our table we put in our order of a pot of tea, a cup of coffee and two slices of cake. Simon went for a doorstep sized wedge of Zesty Orange Cake and I ordered the Lemon and Courgette which endless people had recommended to me. Simon turned his nose up at the thought of vegetable in a cake but oh wow was it good! One of the best slices of cake I've ever had. 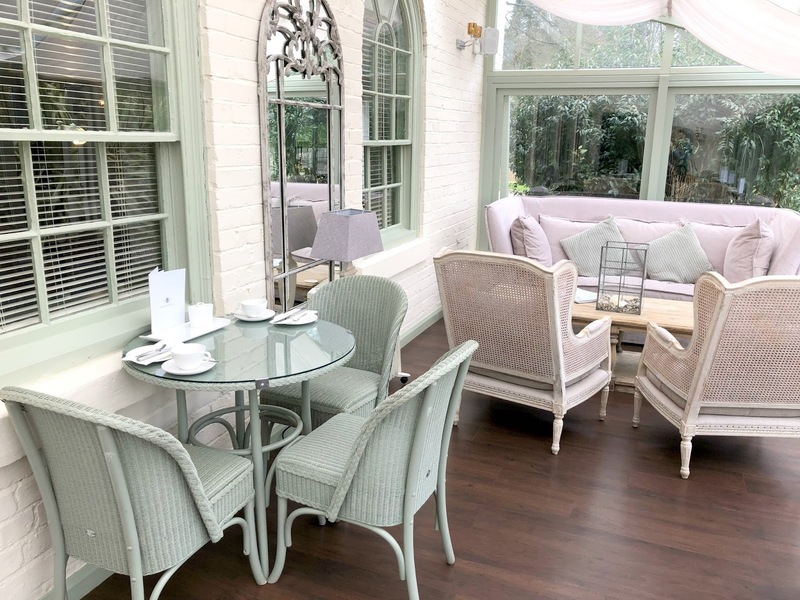 Glancing through their menu I think we'll definitely need to return for a Bertrams afternoon tea soon, at only £13.95 per person and the food locally sourced it sounds absolutely delicious! 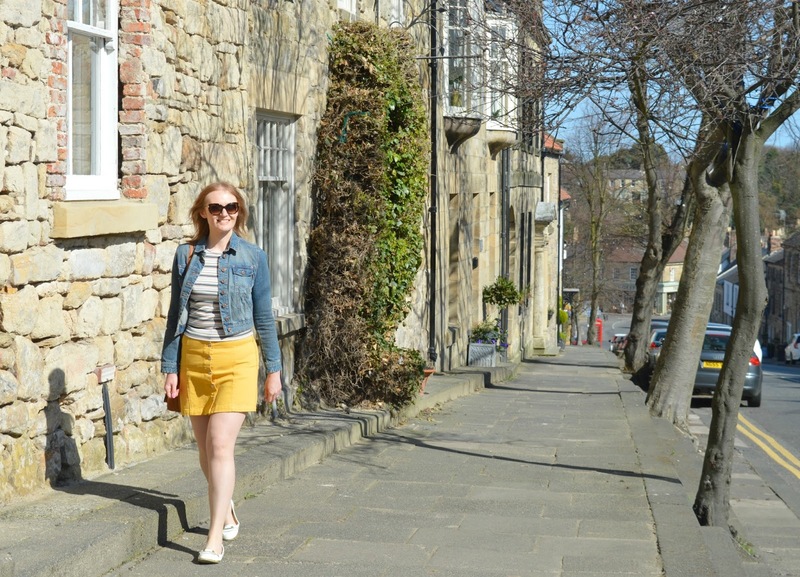 Once we'd devoured our cakes and resisted the temptation to order more we stepped back out into the sunshine for an explore of Warkworth's pretty streets. Lined with the most beautiful buildings decked out in colourful flowers, we stumbled across art galleries, pubs, bakeries and gift shops, each prettier than the last. You know you've hit the jackpot when even the local village shop is a stunner. It has to be said that Warkworth is also a prime place for dog watching (one of our favourite weekend activities) and we made plenty of new four legged furry friends whilst pottering around. Please tell me I'm not the only person to go up to a stranger's dog, get down on the ground and introduce myself whilst completely ignoring the owner? I just can't help myself! 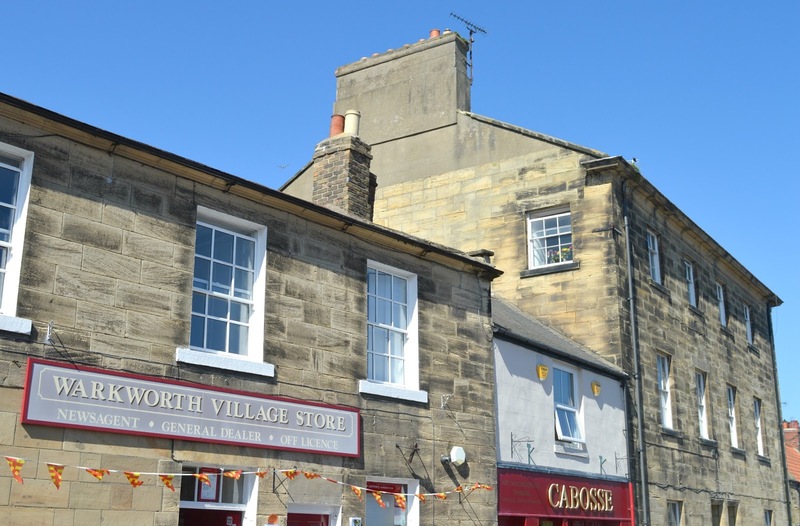 Many of Warkworth's pubs, inns and cafes are dog friendly so it's a fantastic place to explore with your pet! We finished our day trip to Warkworth with a quick stroll over the 14th century Norman Bridge that crosses the River Coquet, so peaceful and a great place to watch the ducks. Whilst I realise we're definitely old before our time, watching wildlife on the river gives us the greatest amount of joy and Warkworth is a fantastic place for a spot of bird watching on the river. 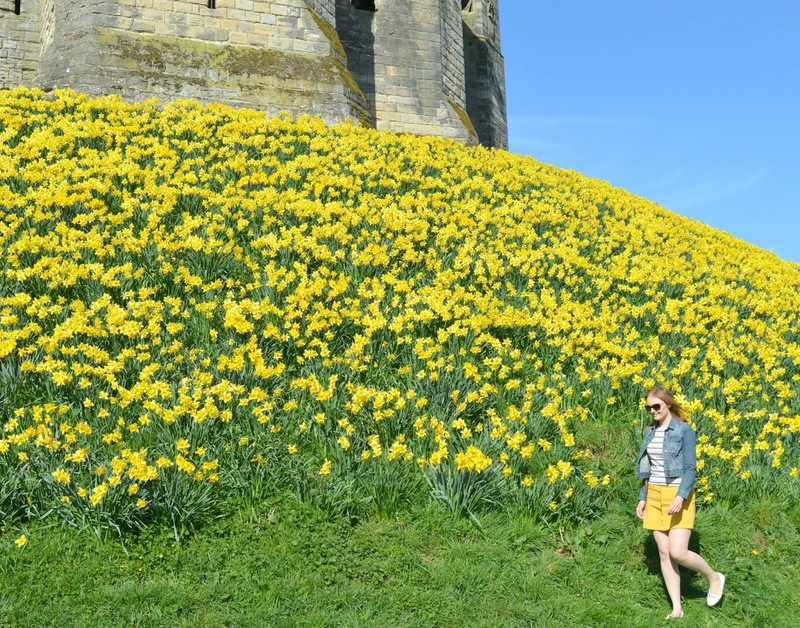 We loved our first ever visit to Warkworth and it most definitely won't be our last, we cant wait to go back and do some more exploring! Let me know where we should explore next! As regular visitors to Di Meos (our ultimate ice cream obsession) we noticed as soon as Crab & Waltzer popped up opposite the ice-cream shop on Whitley Bay seafront. The beautiful outside seating area and the promise of pancakes made us want to plan a visit as soon as possible for brunch by the seaside. Unfortunately since their opening Crab & Waltzer have had pretty mixed reviews, negative comments on their Facebook page and only a 36% excellent rating on Trip Advisor with many complaining about poor service, expensive dishes and average food. 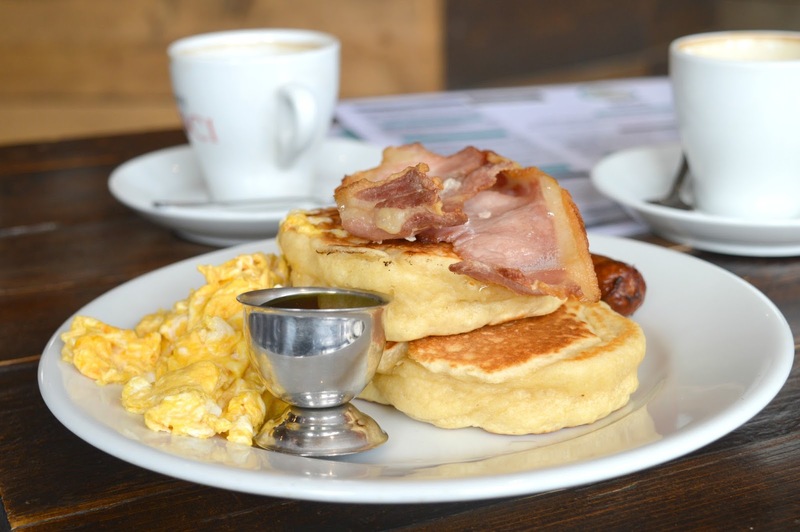 We're not the kind of people that pay too much attention to Trip Advisor so when we had friends visiting over the weekend we made a pancake plan and headed to Crab & Waltzer, our fingers tightly crossed that we would have a great experience. I love the idea of Crab & Waltzer. It is ideally located opposite the soon to be opened Spanish City (so excited! ), has a good amount of tables and the interior is perfect for its seaside location. Little colourful beach huts sit in the children's play area (the restaurant is very kid friendly), some of the seating is in waltzers (love it!) and the place is decked out in colourful lights and fairground inspired signs. It was busy when we arrived with a lot of tables already taken, a handful of children running about and a group of about 10 as part of a 60th birthday group. 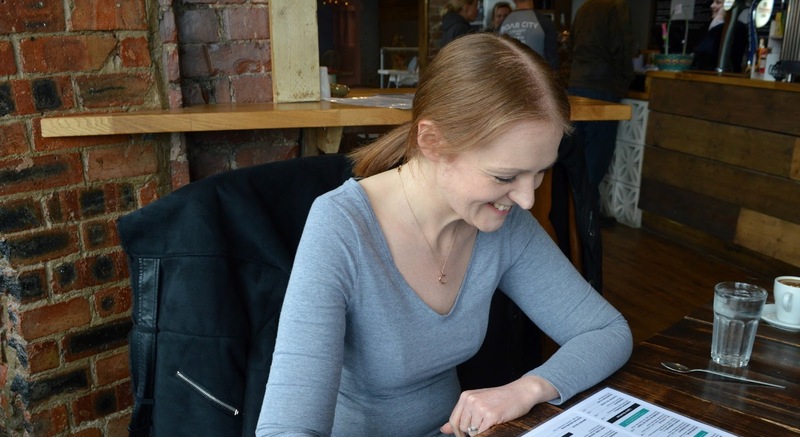 The place had a lovely buzzy atmosphere and we were greeted with friendly smiles and quickly grabbed ourselves a table by the window for a spot of people watching. Ordering coffees all round we took a while to peruse the menu. The choices for brunch are really good, especially the pancake menu which had me picking out three and struggling to choose between them. We all changed our minds a few times before putting in our order and settling down for a chat over our coffees. Around 30 minutes later a very lovely and apologetic waitress came over and confessed that the restaurant was pretty busy and that there would be a wait for our food. She offered us complimentary coffees while we waited which we really appreciated. I'd definitely always prefer that restaurants were up front with customers if there's going to be a wait and as we weren't in any hurry the news didn't really bother us. Second cups of coffee drained and we began to realise that when they had said there'd be a wait, they had really meant it. We'd been waiting for over an hour and were definitely approaching the "hangry" stage where your belly rules your head and you begin to start feeling a little ratty. I have to admit even though we'd been warned about a wait we weren't quite prepared for it being such a long one. When our food turned up I was thankful that the dishes looked so good. Simon and Gary's meals appeared first and after waiting a few moments for the girls' dishes to appear we told them to start without us. Unfortunately ours came out a good 5 minutes after our husbands' meals which was a bit of a shame considering the wait we'd already had. 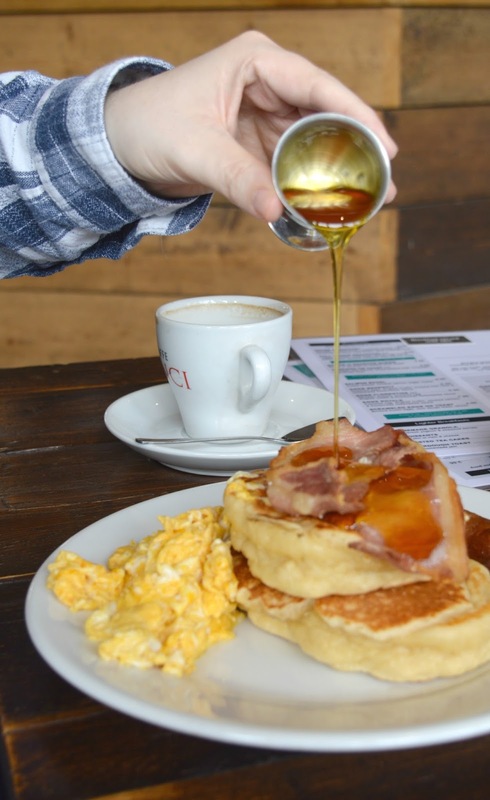 Simon had the Breakfast Pancakes (£7.95) - Buttermilk Pancakes, Bacon, Sausage, Scrambled Egg and House Syrup. He eagerly demolished the Bacon, Sausage and Scrambled Egg but I soon noticed that he was struggling to get through his pancakes. It's not often that Simon leaves food but when I took a forkful of his pancakes I could see why he couldn't finish his dish. They were too stodgy and dry and I think this particular dish would be better served with a smaller version of the American style pancakes. Gary ordered the House Breakfast (£8.95) - Sausage, Smoked Bacon, Mushroom, Tomato, Egg, House Baked Beans (which looked particularly good), hash brown, black pudding and a sizeable slice of buttered toast. He had asked for his meal without Tomato which unfortunately had somehow made its way on to his plate. No harm done, but after the long wait for food it wasn't the best service. Luckily I have more success to report from the girls' dishes. 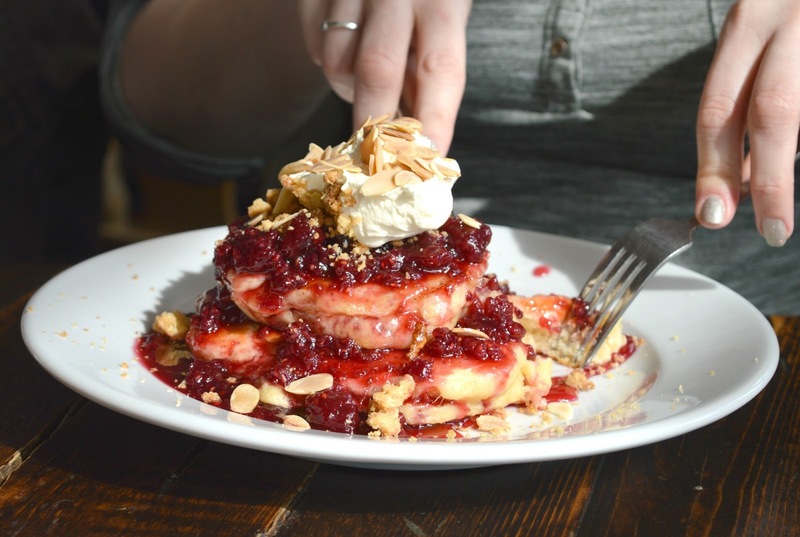 Jenny had the Bakewell Crumble Pancakes (£6.95) - Raspberry and Almond Compote, Toasted Flaked Almonds and Homemade Crumble sitting on Buttermilk Pancakes. Her brunch looked so good and I had serious food envy when they appeared in front of her and she made a good effort to get through both pancakes before getting too full and having to give up. I opted for the Sweet Ricotta Pancakes (£7.55) - served with cinder toffee butter, strawberries, bananas, blueberries and house syrup. Wow how good does it look? The presentation of the dish was spot on, so deliciously colourful! It tasted even better than it looked, I absolutely loved the flavours and enjoyed every forkful. I almost made it to the end but had to quit just before the last bite because I was too full up. 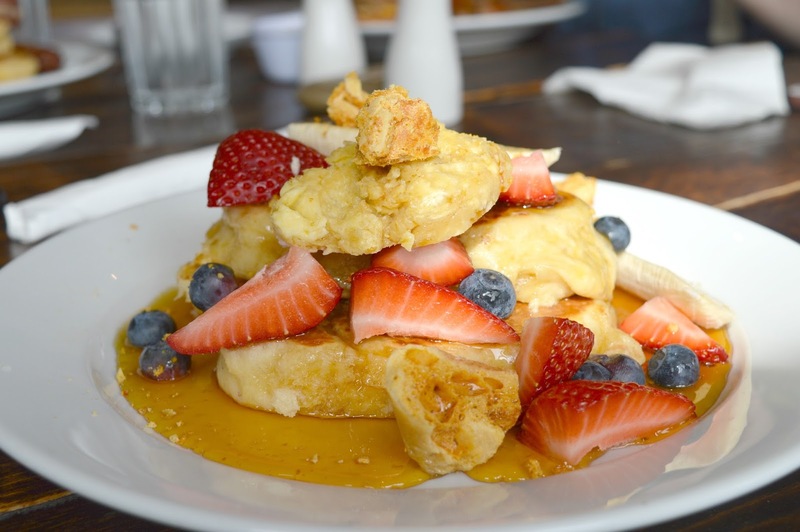 Our experience at Crab & Waltzer was a mixed bag and whilst I'm thankful that my brunch was so tasty I am a little gutted that I can't give this place the glowing review that I really want to. With more than a handful of people reporting of bad experiences at Crab & Waltzer it's definitely time for the restaurant to make the few changes to ensure that it's the place that everyone wants it to be. With Whitley Bay fast becoming the seaside town to visit in the North East I am keeping everything crossed that this lovely seaside restaurant manages to turn things around before the Summer trade hits the seafront. We desperately want them to succeed and we're definitely not ready to give up on them yet! Fingers crossed that next time we visit we'll have a different story to tell. I'd love to know if you've made it to Crab & Waltzer and what your experience has been like. With no overseas holidays planned for us this year (we're still paying off last year's Honeymoon!) 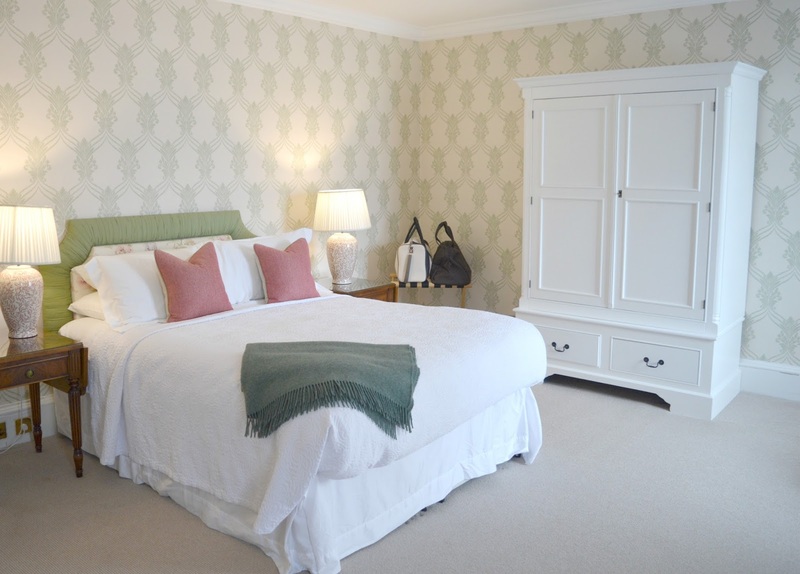 we are happily exploring the best hotels in the North East and indulging in luxury staycations. We are so lucky to live in such a beautiful part of the country and the choices of stunning places to stay are endless. 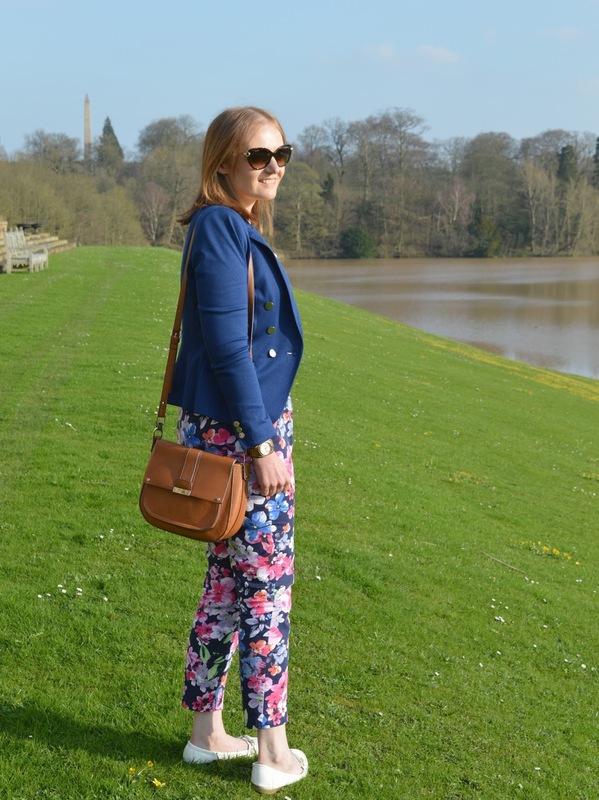 Our latest adventure took us to Wynyard Hall Hotel and Spa for a Spring staycation. 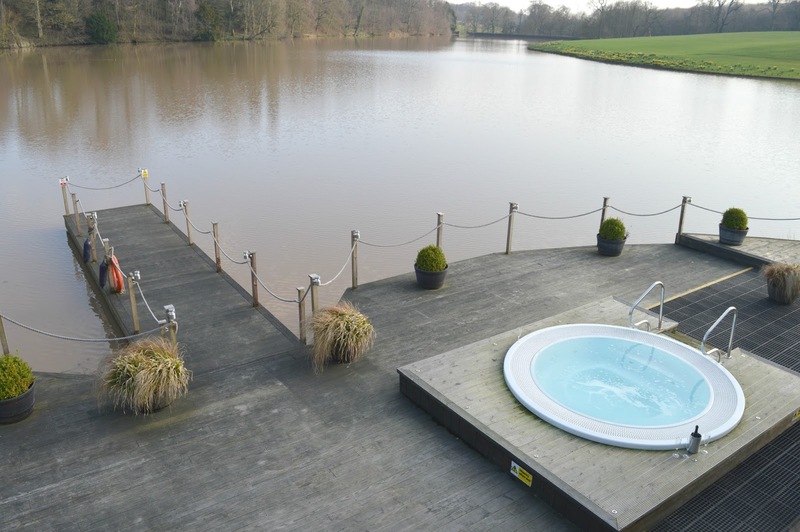 You'll find Wynyard Hall in the Tees Valley, sitting in 150 acres of the most magnificent landscape complete with gardens, lakeside spa, restaurant and farm shop. As soon as we made our way down the never ending driveway to the front door we knew this was going to be one of those hotels that we would want to move in to. Walking through the doors we were stunned by the beauty of the hotel - its grand entrance, high ceilings and ornate features had our jaws dropping to the floor, it felt so luxurious! 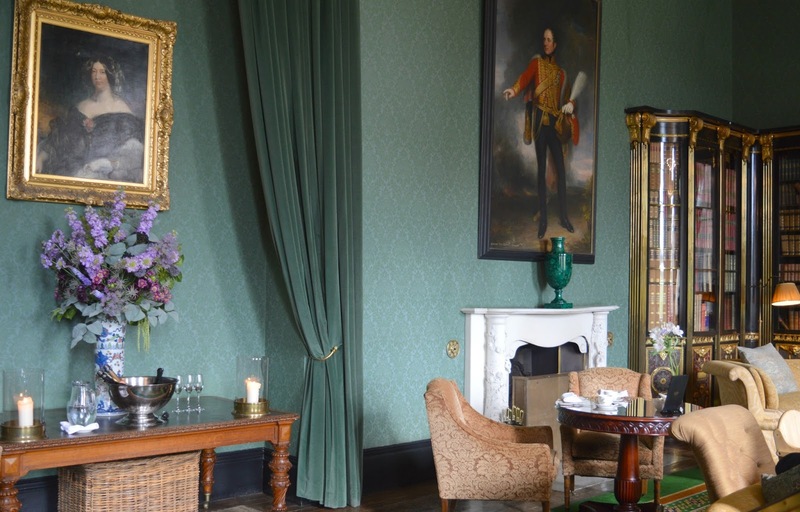 Wynyard Hall is a four star hotel that ticks every box when it comes to a picture perfect staycation. From the huge displays of colourful fresh flowers (they are seriously stunning) to the cosy corners of the Library and the fancy cocktails of the bar - it truly is a destination hotel where you can enjoy the finer things in life. Greeted on reception with warm smiles we checked in before being personally escorted up to our room for the night, the Lady Theresa Suite. Wow, she was a beauty! As we were being shown around it took every ounce of self control not to skip round the room like over excited children. Of course we played it cool until we were left alone and then we couldn't help but open every door, cupboard and drawer for a nose, it was all just so perfect. A marble and wood desk covered in local magazines was the first thing we noticed before our attention quickly turned to the comfy chairs sitting in each window, the beautiful dressing table and, the centre piece of the room, the King Sized Bed with the most beautiful pink and green floral headboard and matching cushions. 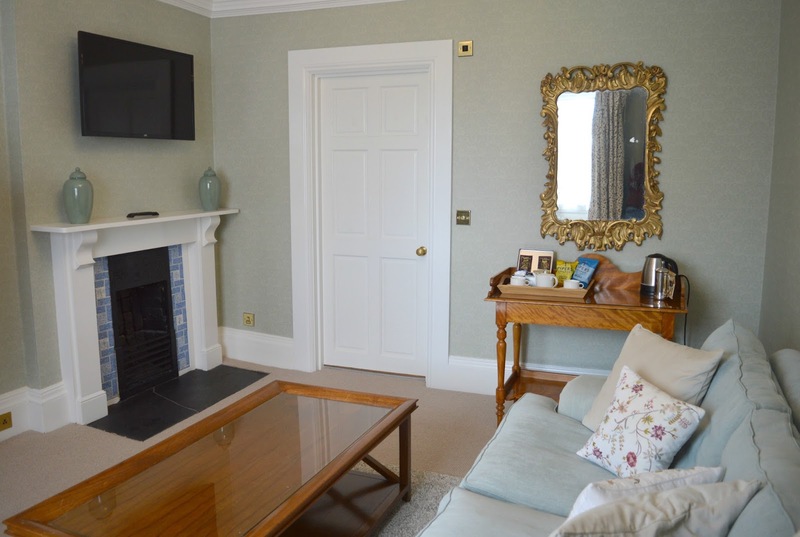 The lounge area of the Lady Theresa Suite was through a door into a separate room complete with fluffy rug, plush sofa, ornate fire place and flat screen TV. Simon immediately made it his room and it was really lovely having so much space to enjoy our night away. Simon has a habit of switching the TV on as soon as we get into a hotel room which drives me completely mad so he shut himself away into the lounge to catch up on the box whilst I enjoyed some quiet time in the main bedroom. We had everything that we could possibly need in our room, super fast wifi, fluffy dressing gowns, a tea tray decked out in goodies (the Ringtons biscuits lasted all of a minute! ), delicious smelling toiletries in the ensuite and, much to Simon's joy, a very impressive list of DVDs available to borrow from reception! 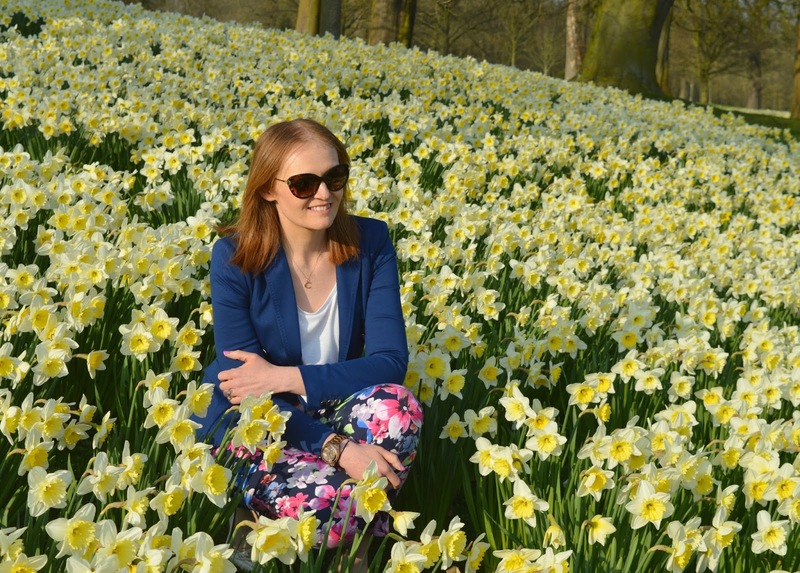 It took a lot of effort to drag ourselves away from our suite but I'd heard great stories about the dazzling display of daffodils at Wynyard Hall and had to see them for myself. 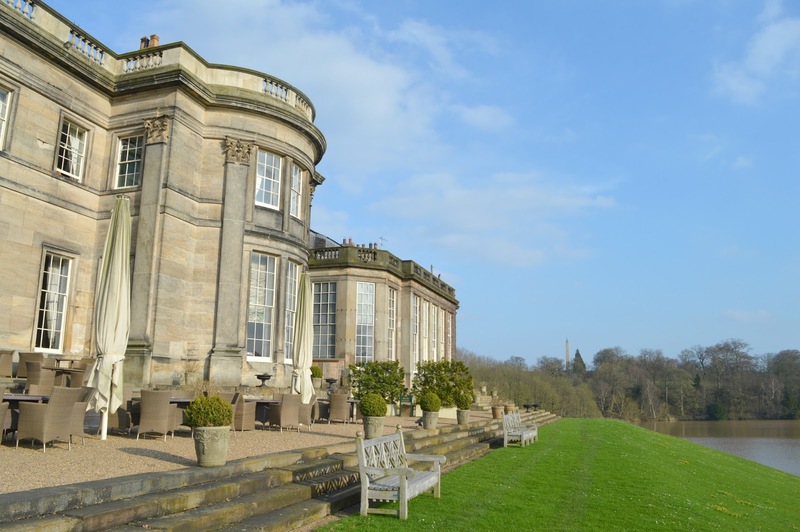 Wynyard Hall has most beautiful landscape so it's essential that you get out for an explore during your stay. We had been blessed with a rare sunny afternoon and stepping out of the back of the hotel we were amazed by the size of the outside seating area with charming views of the Tees Valley. What a spot! 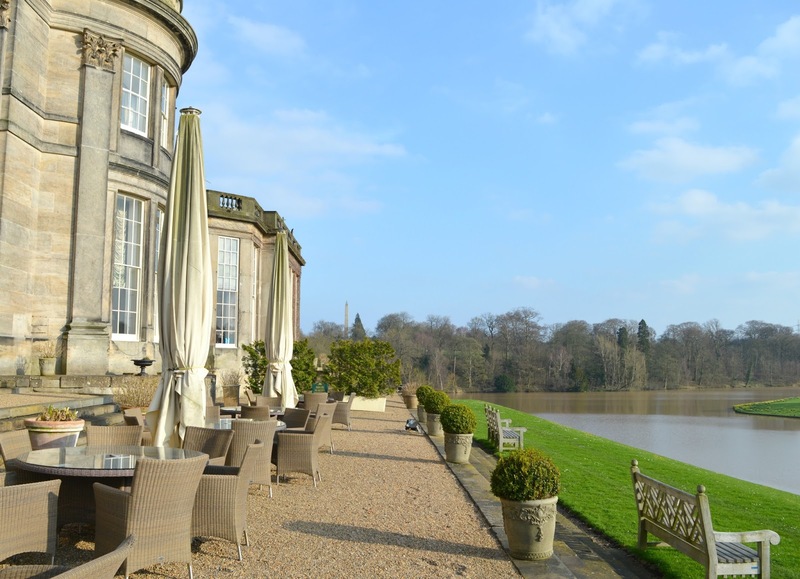 With plenty of tables and chairs for guests to enjoy, it's quite the sun trap and I can imagine that long hot Summer evenings at Wynyard Hall are very special. Imagine enjoying a night of tapas and wine out on the terrace! 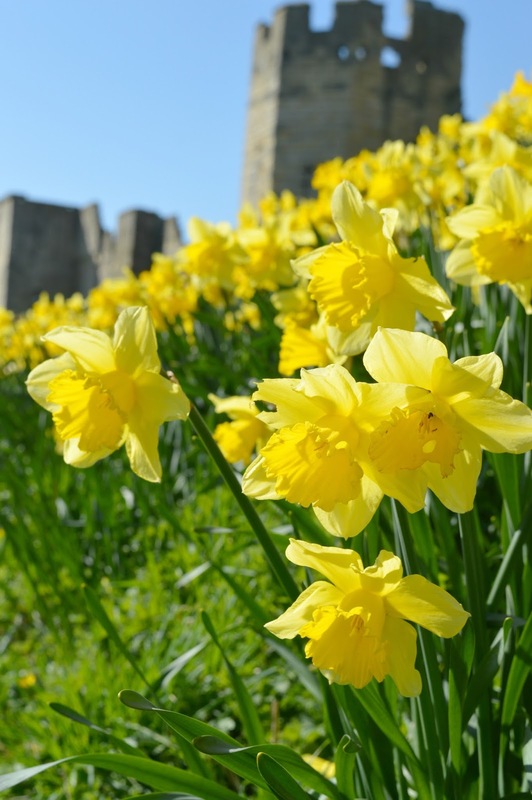 It wasn't long before we found the daffodils - you can't really miss them! 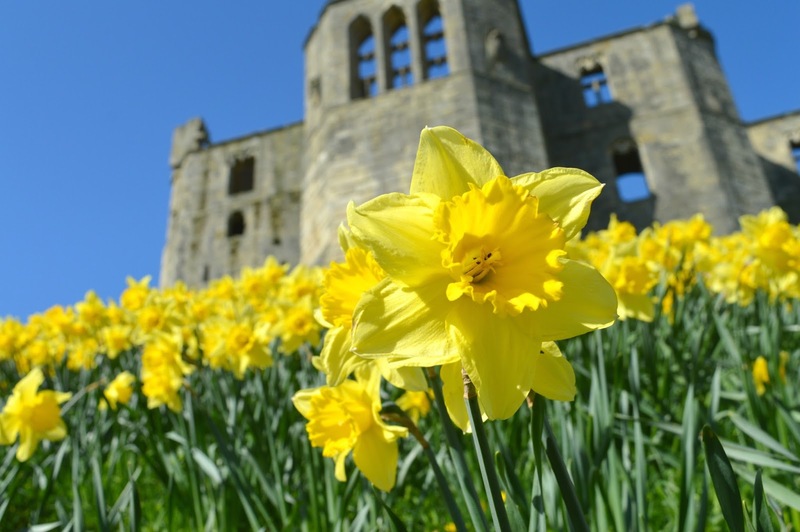 The most impressive display of sunshine yellow flowers, they surely have to be the finest daffodil collection in the North East. Golden hour had just hit and the flowers were bathed in the most beautiful light, it was one of those moments in life where for a short while you forget all your problems and everything feels perfect. When Simon eventually managed to drag me away from the flowers (believe me I was reluctant to leave them!) we went on a little walk to the Glasshouse and Farmshop which is hidden away in the walled gardens on the edge of the estate. 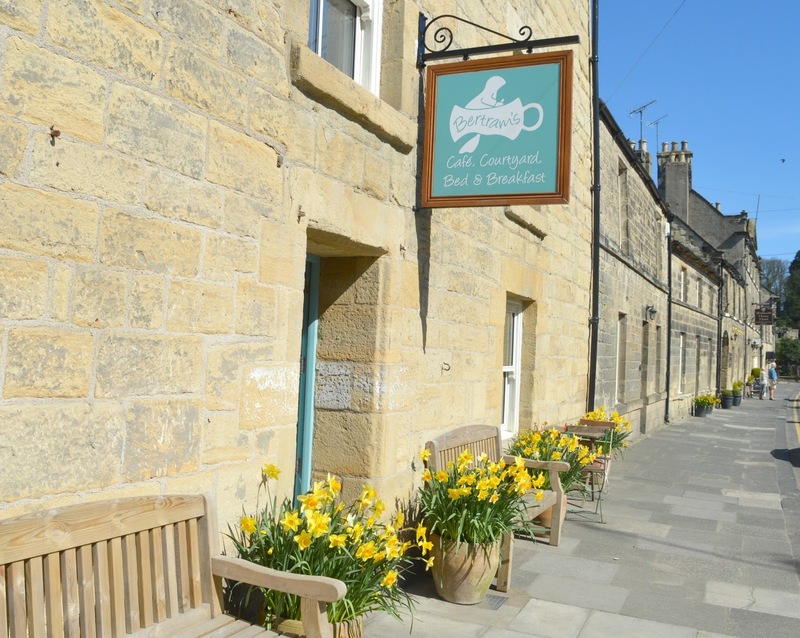 Boasting the loveliest little coffee shop and an adorable gift shop full of beautiful homewear and gifts it's a great place for a mooch and if you want even more of a leg stretch there are also the gardens to explore. We treated ourselves to a coffee and having just about resisted the temptation to buy 10 jars of jam that we didn't really need we returned to our Suite, tired out by the fresh air and more than ready for a lovely long sleep. After a perfect night's sleep we found it pretty tough to drag ourselves out of the massive bed. We did wonder why we hadn't had the sense to order breakfast up to our room the night before! This was soon forgotten when we remembered that breakfast was served in the Wellington Restaurant, one of the most beautiful rooms in the hotel. 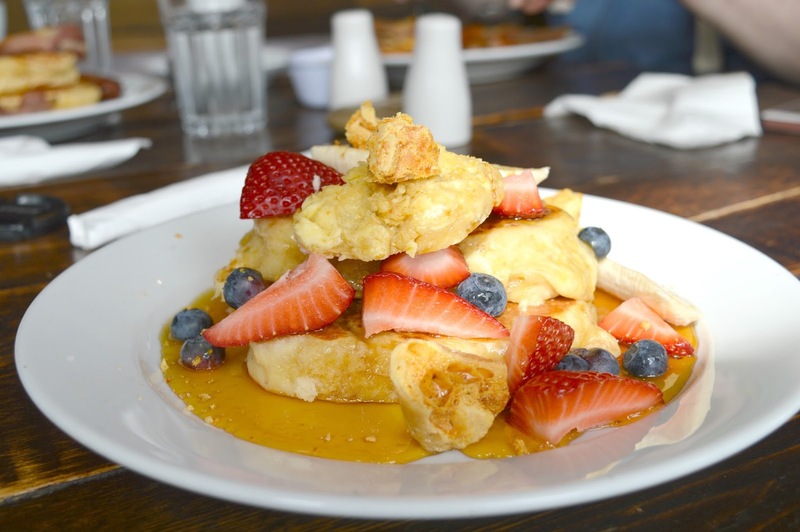 With the sun pouring through the large windows, it was the perfect place for a long leisurely breakfast. 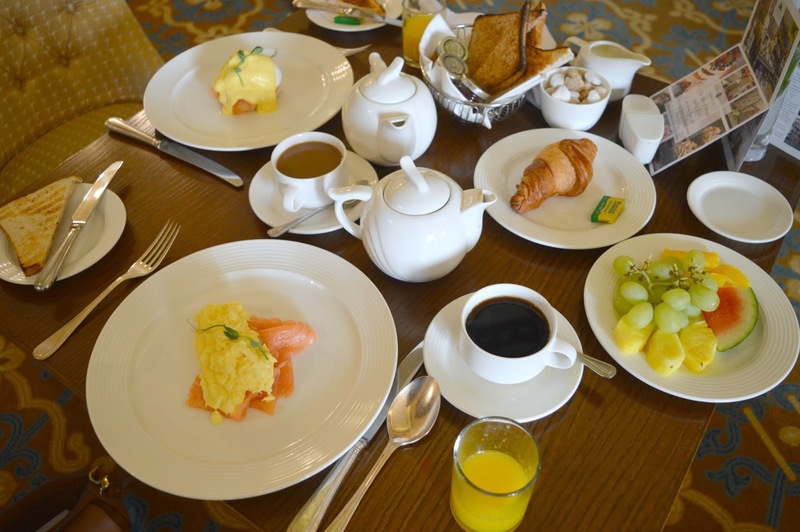 Breakfast is included in all rates at Wynyard Hall and it's a full on foodie affair with a generous selection of continental treats displayed in the centre of the room as well as a delicious hot breakfast menu. Not being able to help ourselves we took full advantage of the help yourself breakfast treats and if I was being completely honest with you I'd confess that I indulged in some toast, silly amounts of coffee, a croissant (slathered in jam of course!) a bowl of cereal and a pile of fruit, possibly followed by a tiny taste of Simon's blueberry muffin. Did I have room for a cooked breakfast too? Of course I did! I opted for the Scrambled Eggs and Salmon and it was the perfect sized dish to tuck into after all that I'd already indulged in. I was so thankful it was a beautiful light dish and didn't sit heavily on my tummy. 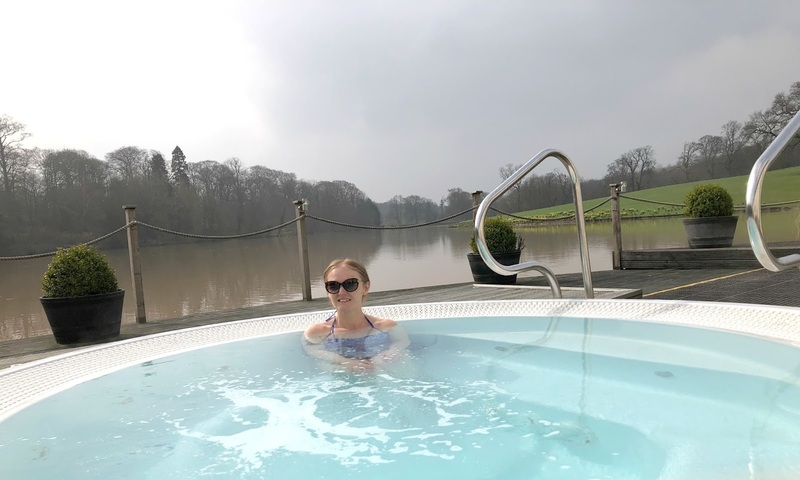 Our 11:00 am checkout arrived too soon, but luckily there was no time for sulking as we were off to Wynyard Hall's lakeside spa for a couple of hours rest and relaxation. We had a wonderful welcome on the spa's reception and were shown to the changing rooms to pick up our complimentary robe, towel and slippers from our allocated lockers. We were pretty surprised to discover that the changing rooms were communal but it was understandable as the Spa is pretty tiny. There are private changing areas to get undressed in and I didn't find it uncomfortable at all, I think Simon was a bit bemused by the ladies gossip that was happening around him though! Once we were decked out in our robes we were given the guided tour and shown round the different areas of the spa with a full explanation of the steam room, ice fountain and salt inhalation room before being left to enjoy our time. With the sun blessing us with the most perfect warm morning we decided to make the most of the weather and headed straight outside where we found some sun loungers as well as two hot tubs. In other spas we've sometimes found ourselves a bit frustrated by hot tubs being hogged for hours by large hen groups or that annoying couple that don't like to share, at Wynyard Hall the spa is capped at 10 people and with arrival times staggered it was so beautifully quiet and everyone had a perfect amount of space and plenty of chances for a peaceful soak in the hot tub. Our favourite hot tub looked out over the lake and it was absolute bliss lying back quietly chatting and watching the ducks, it was so peaceful. If you're feeling particularly fancy there's a drinks menu so you can order a glass of fizz to enjoy in the tub - we'll definitely be doing that next time we have a special occasion to celebrate! The weather outside was so perfect we couldn't really be bothered to move and our two hours vanished as we hopped between the hot tub and sun loungers. Being a self confessed foodie I was particularly taken with the spa's pretty conservatory area where they serve lunches and afternoon tea. Imagine chilling out in your robe tucking into plates of sandwiches and scones after a relaxing massage! I'm definitely going to book myself in for a spot of food next time we visit. 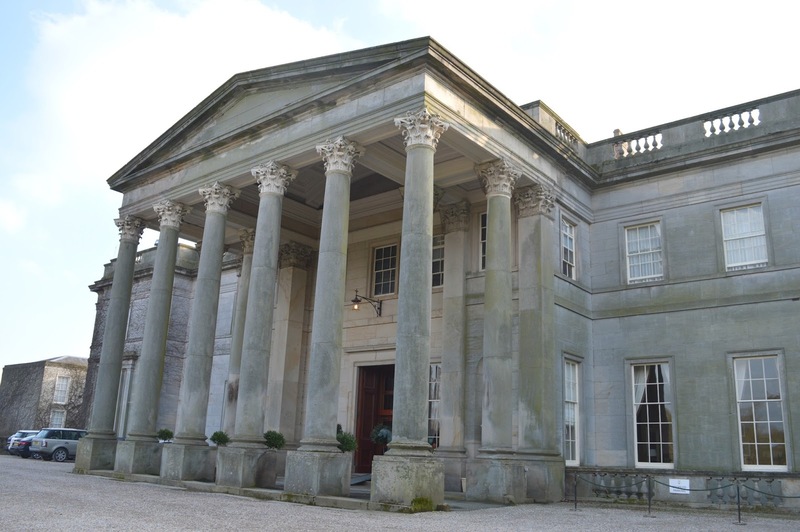 I left Wynyard Hall completely obsessed with the place, I spent our entire stay just saying to Simon "I love it here" and he knew he was going to be struggle to get me into the car to leave as soon as I started to call it "home". 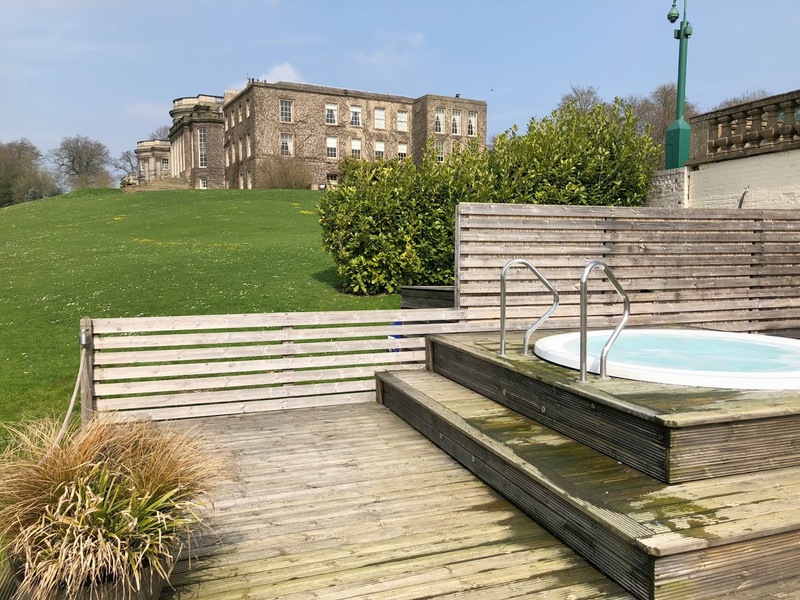 Everything about our stay was perfect and I'm already planning our next visit - my sisters are coming to stay with us in the Summer and I'm really keen to take them to the spa and I know that Simon and I will most definitely be returning for one of the events. 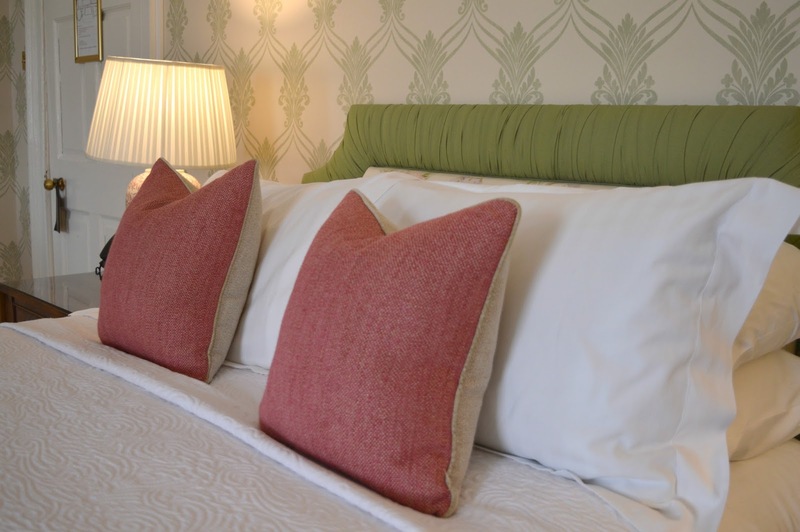 If you want to enjoy your own Luxury North East Staycation at Wynyard Hall, Country Classic Bedrooms cost £205 per night, Superior Doubles are £235 and Executive Doubles and Suites cost £285. Guests can enjoy the Spa at Wynyard Hall for £20 per person for 2 hours and receive 20% off full priced spa treatments. We were invited to a complimentary stay and spa visit in exchange for this honest review. Liz Earle at John Lewis, Newcastle - Get The Glow! I grew up with eczema. Really bad eczema! Eczema so awful that even now, my parents talk about how baby Chloe cried in pain all night every night and they got no sleep! Thinking back, my skin problems affected me a lot growing up - chlorine was so painful on my skin that I never learnt to swim, other girls at Brownies didn't want to hold my hands because they "felt disgusting" and my poor Mum spent a fortune trying lotions and potions to soothe my poor red skin. And I think that's why I fell in love with Liz Earle, a lady who herself has battled eczema and became inspired to create a skincare range that she could use without irritating her skin and could be used by people of all skin types who want a simple, yet effective skincare routine. 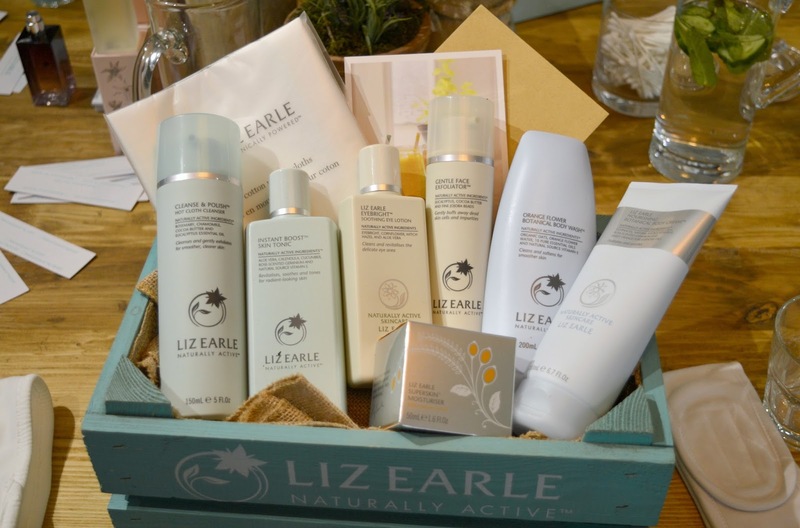 You may have noticed that Liz Earle don't go for the heavy marketing campaigns - you wont find any world famous actresses pushing their products on TV or glossy spreads in the beauty magazines. They rely simply on the great quality of their products and working with their customers and fans to help spread the word. As soon as you start using Liz Earle you realise why they don't need to plough a load of money into advertising, the products speak for themselves. And the very best thing? Liz Earle is a luxury skincare brand that doesn't cost the earth. Far more affordable than their competitors I love that when I run out of Cleanse and Polish I can just happily stroll into John Lewis in Eldon Square and pick myself up a new bottle without having to save my pennies. You might be forgiven for thinking that after that rather gushing introduction that I am a Liz Earle skincare expert. I'm really not! In fact I'm yet to get much beyond their iconic Cleanse and Polish (the product that started it for most of us!). I use it every day and have so many backups lying around the bathroom that my husband is pretty sick of tripping over them! I swear by it and am more than a little hooked on buying their limited edition bottles that come in the most delicious smelling scents. So really it was about time that I tried out some more of their products with a little introduction to the wonderful world of Liz Earle at the John Lewis store in Newcastle. After quizzing the ladies behind the counter for a while about how to cleanse (turns out I'd been using a little too much product on my cloth!) they very kindly took me through a skincare routine, showing me how to apply each product and the benefits of the ingredients that are used in each one. Now at the age of 30 something, I feel like a proper grownup with a skin care routine that actually has me looking forward to the part of the day when I take my makeup off. After my Cleanse and Polish I've just started to use the Instant Boost Skin Tonic, which is the first truly gentle tonic that I've used. I've always been too terrified a toner in the past as they can be so harsh but the Liz Earle tonic is really gentle and moisturising. Now that I'm getting a little older I've also decided that I need to take a little more care of my eye area so have invested in the Liz Earle Eyebright, a soothing eye lotion perfect for my tired puffy eyes. So those are a few Liz Earle products that I'm planning on trying out this month and adding to my routine but I'd love to hear what your favourites are and what I should try next! If you're a new or old fan of Liz Earle the lovely ladies at the John Lewis counter in Eldon Square would love to see you! 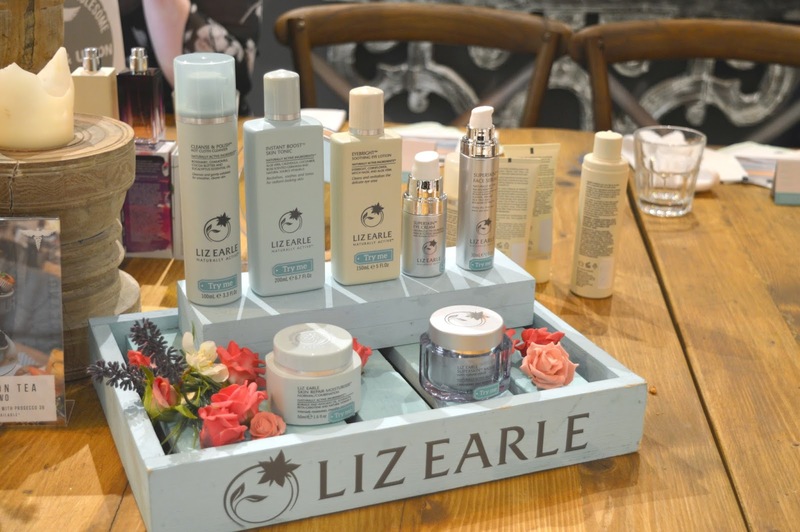 I was invited to a bloggers event by the Liz Earle team at John Lewis but chose to share this post with you all as I'm a huge fan of the products. A few years ago my friend Lisa introduced me to VIP Teas in High Spen. 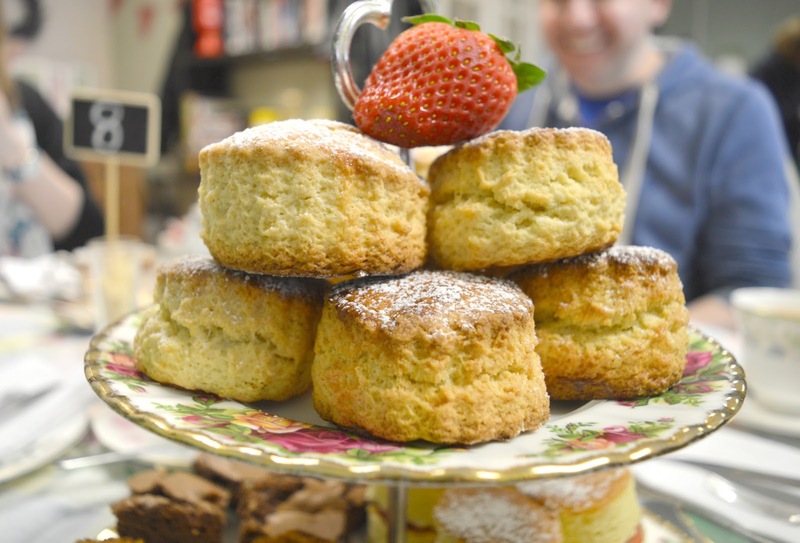 We enjoyed the most wonderful morning of homemade cake and delicious scones and I vowed to one day return for their afternoon tea .. how on earth did it take me so long to keep my word? Last weekend we had friends from the south visiting us and, eager to impress them with the finest North East food and hospitality, I remembered VIP Teas and how wonderful it was and decided now was the time to finally book in for the afternoon tea. 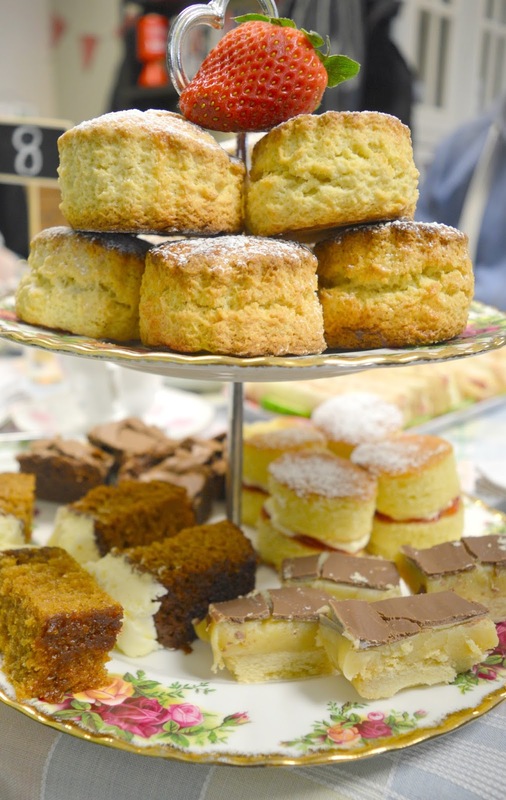 If you're going to show off to visitors it's definitely best to do it surrounded by homemade cake that they can't get outside of the North East! VIP Teas is in the little village of High Spen near Rowlands Gill (very conveniently close to two of our favourite places - Gibside and The Metrocentre!) A cute and friendly tea room run by locals and with the most amazing warm welcome from the second you stroll in. 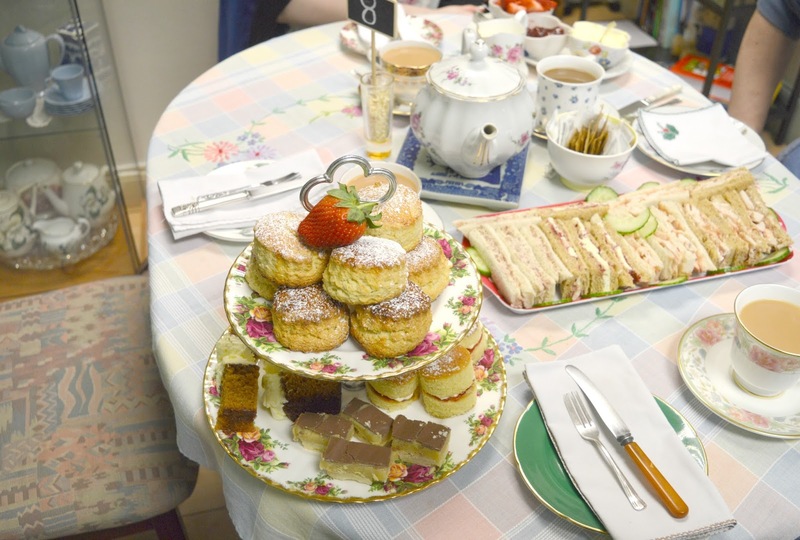 If you love tea rooms extra twee with brightly coloured table clothes, vintage china and bunting then this is your kind of place. It's also worth noting that the cake counter at VIP Teas is one of the most impressive in the North East, it is completely covered in cake, meaning that you're highly likely to end up going for several slices because it's impossible to choose just one. 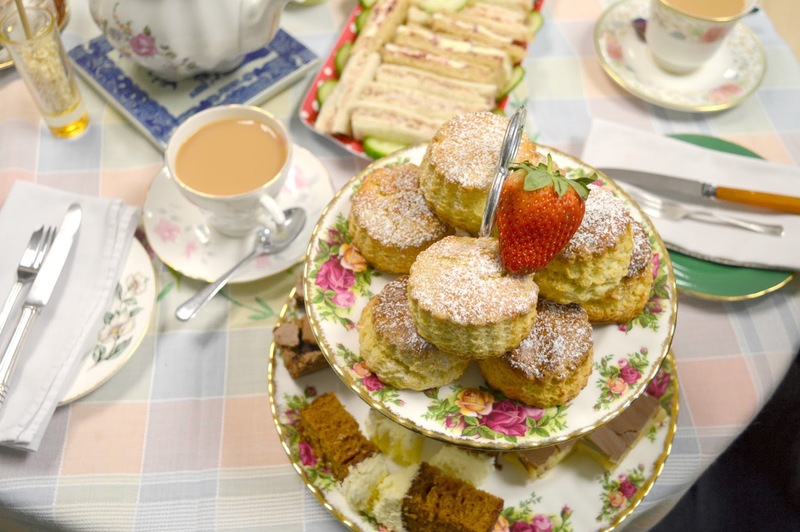 Afternoon Tea at VIP Teas has to be ordered in advance with a £10.00 per person deposit payable at the time of booking. Completely fair when you consider that all of their afternoon teas are made fresh to order. Our tea cost £15.95 per person which included a sandwich of our choice (we all really loved being able to choose exactly what we wanted), two sweet scones each and a selection of homemade minature cakes. I really love the moment when your afternoon tea arrives at your table and your eyes bulge at the sight of it and VIP Teas really gave us that moment (and some!) the stand was completely covered in cakes, so much so that our sandwiches were delivered on a different plate. Our spread of food covered the table and being "that annoying person" I made everyone sit on their hands whilst I lovingly photographed it. It's not often that we have afternoon tea with another couple, and it was the perfect way to catch up and relax. We happily chatted between our tiers meaning that our afternoon tea lasted a good few hours - far more enjoyable than when Simon and I go alone and end up woolfing through an entire afternoon tea in around 30 minutes! Next up, the mini scones! 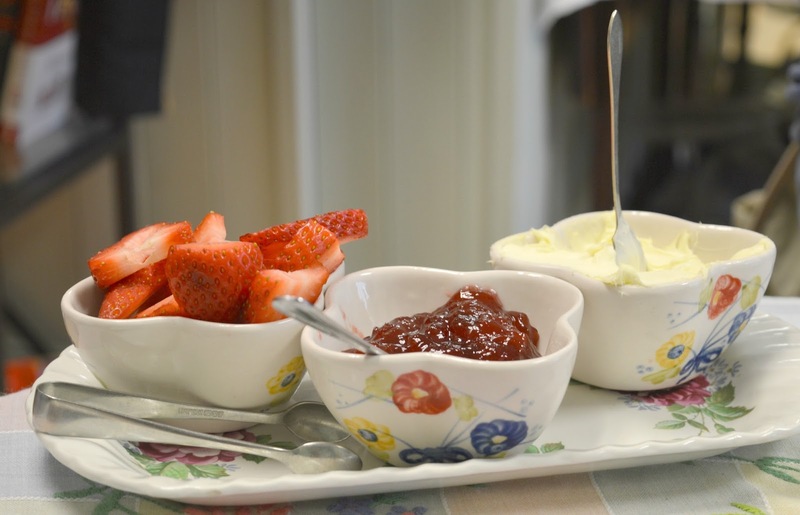 We had two each which were served with the largest dishes of jam and cream you've ever seen alongside some fresh strawberries which was a lovely added touch. Before our afternoon tea had arrived we'd had a rather long conversation about how annoying it is when places claim to serve "clotted cream" only for a dish of something suspiciously squirty looking arriving. The cream at VIP Teas was perfect! So thick that we could stand the spoon up in it, glooping it onto my scone involved expert afternoon tea skills and it was so good on the scones! We paused a while before tackling the cakes, taking them in order of what looked the lightest first (a good afternoon tea tip if you don't want to get full too early!). We started off with a slice of moist ginger cake, before arriving at the most amazingly fluffy victoria sponge before ending our afternoon with caramel shortbread and gooey brownies. Make sure you let me know your favourite afternoon tea! Have you ever been obsessed with a musical? So obsessed that you know all the lines, own the soundtrack and whenever you watch it on stage you have to stop yourself leaping into the aisles to sing along (no one likes an out of tune wannabe sitting next to them in the theatre!) 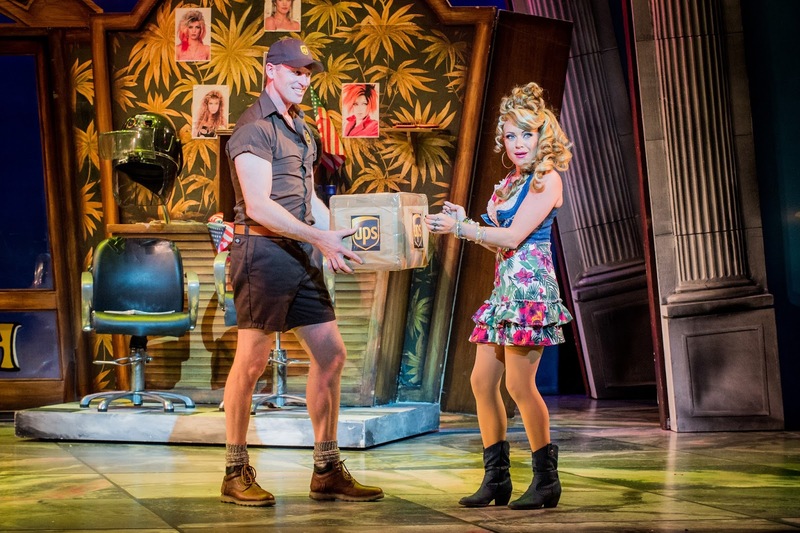 This week my obsession, Legally Blonde, arrives at Sunderland Empire and I admit that despite having seen it in the West End at least five times I am thrilled that it has arrived in the North East. Of course obsessions are best shared so last night I decided to share Legally Blonde with my husband Simon and we set off for Sunderland Empire, me feeling slightly nervous that he wouldn't love the show as much as I wanted him to! Based on the book and popular film starring Reese Witherspoon, Legally Blonde tells the story of popular sorority girl Elle Woods whose main focus in life is to wear as much pink as possible and marry long term boyfriend Warner. Living in a happy bubble Elle lives her life from party to party until one day the love of her life dumps her for not being serious enough. Determined to win him back Elle follows him to Harvard Law School but can a girl who's always cared more about her hair and nails than school really make it as a law student? 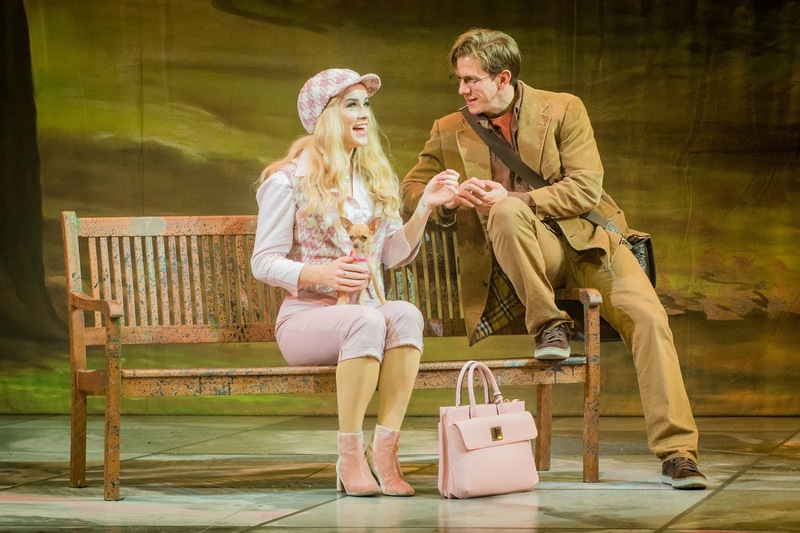 So does Legally Blonde work well on stage as a musical? Hell yes! Once you've seen the story on stage it's hard to imagine that it ever wasn't a musical! As soon as the opening bars of "Omigod You Guys" start you know the songs will be stuck in your head for days to come. The songs are catchy and each one is quite the performance, I challenge you not to have a little dance in your seat at least 10 times! Having seen the nation's sweetheart, Sheridan Smith in the lead role many years ago I was a little worried how this latest production would compare but the show is definitely in safe hands with Lucie in the lead role. Lucie's comedic timing was spot on and the whole audience fell for Elle the second she came on stage. Biggest applauses of the night went to ex Eastender Rita Simmons in the role of Paulette who did an outstanding vocal in her solo song "Ireland" and Emmerdale's Bill Ward as Professor Callahan got a warm welcome onto the Empire stage. So what did my husband think of my favourite show? He was won over! You may think that Legally Blonde is best seen with your girlfriends, but thanks to the quick dialogue, witty one liners and jokes aplenty the show really does appeal to all! The audience at the Empire particularly loved the UPS delivery man who got everyone feeling a little hot under the collar and the all singing and dancing court room scene went down a treat. Legally Blonde gave me a night of every emotion and I was completely immersed in the story, so much so I was blinking back the tears during the title song "Legally Blonde" and has left me wondering if I can maybe head to Sunderland to see the show again before it finishes! 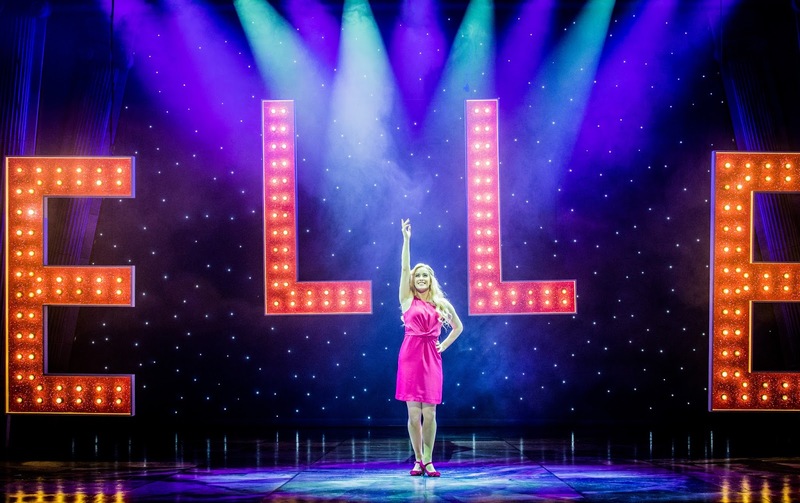 Legally Blonde is at the Sunderland Empire until Saturday 21 April and tickets start at £15.00 and you can buy yours here. I was invited to press night of Legally Blonde and was given two complimentary tickets for review purposes.